The Live Life In OVERDRIVE experience began in 2013, and we have enjoyed a proud and valuable partnership with Audi who were the first manufacturer in India to support this initiative. In 2018, the sixth edition of the epic Independence quattro Drive will see you journey for 9 days in Audi's range of SUVs to celebrate Independence Day like never before! This is an adventure that your children will probably narrate to their children over a camp fire, someday in Ladakh, driving an Audi SUV on a Live Life In OVERDRIVE experience! In this sixth edition, you as an OVERDRIVE editorial member will write this script for us so expect to bear witness to more than the usual. This adventure isn't for the faint of heart, but we will teach you just how to survive in one of the most demanding regions of India. You will also get to experience what a luxury 4x4 SUV brings to the table while you soak in the magnificence of the Himalayas. We will have the new Audi Q7 and the Q3 as our workhorses on this drive. Five of these luxurious, capable and stunning SUVs will take us through some extreme terrain. By the time we conclude, we guarantee you will be begging for more. You would probably become as hopelessly addicted as we are and make the trip back again on your own! This year we will again split the entire experience into two groups. The adventure for Group 1 will begin from the ‘Fort of Chandi’ or the city more popular for being India's first planned city post Independence – Chandigarh. It's also the city to have given us some of the finest names in motorsport. This beautiful and orderly city is the gateway for all those seeking to write their stories in remote Ladakh. From this meeting point Group 1 will set off for Manali. The 350 kilometre drive into the Kullu valley takes you past deep gorges with the river Beas rushing downhill alongside the highway. Lush vegetation, smooth tarmac and the crisp mountain will greet you as you drive into Manali. Our foray into the Himalayas begins from this lovely but crowded hill station! Over the next week we will challenge high altitude passes, extreme cold and winds that have shaped the mighty Himalayas. Around every corner a new and startling vista will unfold, so don't forget to carry your cameras, binoculars, memory cards and plenty of batteries and chargers! You will drive Audi’s highly capable SUV’s over formidable mountain passes that have names like Baralacha La, Tanglang La, Lachalung La, each sounding more formidable than the next. For the last two years The Q3, Q5 and the Q7 have been faithful companions, easily crossing over all the hurdles the Himalayas have thrown at us. Now while we try and keep you in comfort when the days driving is done, not all of our comfort means a warm room with hot soup and delicious buffets! We promise you a bed. Sometimes it would be under the stars, sometimes with the cold Himalayan air embracing your bones. Sometimes the food may be exactly what you get in the city, other times a bowl of piping hot Maggi may seem like manna from heaven! We urge you to step into this with an open mind, and warm clothes! Did we mention this trip was the opportunity of a lifetime! 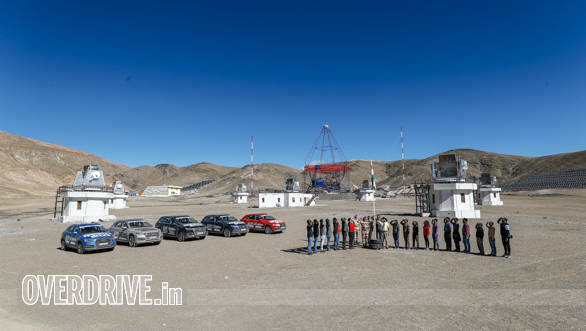 At Leh after a days break, we will be joined by Group 2 and together we will proceed towards the Nubra valley. Nubra is home to the Hundar sand dunes and the Bactrian camel, both of which are oddities in this harsh and cold environment! This also means we will cross over what was once the highest motorable road in the world - ‘Khardung La’. This formidable mountain pass is situated at a height of 17582 feet (nearly 5,359 metre) above sea level. The oxygen at this height is thin, the pass is almost always covered in snow, and while you will feel cold, the sun will also give you a sunburn. From Nubra we will drive to Turtuk, the village offers views of Beautiful Valley, part of the Shyok Valley. It is the last major village where tourist activity is allowed before the Line of Control. It is at this point where we will also hoist our national flag and celebrate India's Independence Day.Click on the REGISTER link to sign up - it's your time to write this story for us! While we intend to remain true to the details of the trip mentioned above, some elements may change depending on weather and geographical conditions. Register Now! Only 10 seats to offer! 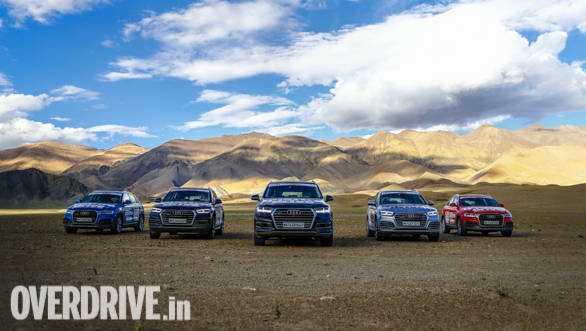 Click here to view photos of the earlier editions of the INDEPENDENCE QUATTRO DRIVE. 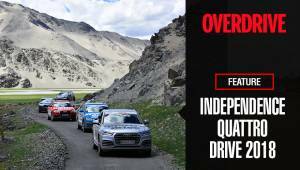 The Independence quattro Drive road trip ("Road Trip") is being organized and conducted by Network18 Media & Investments Limited ("Network18"). The Terms and Conditions detailed below apply to all entrants registering for the Independence quattro Drive road trip. Selection thereof by every participant is an acknowledgement of acceptance of these Terms and Conditions by the participant. The Road Trip shall cover a distance of approx. 1500kms. Participant should not have any criminal background and Network18 holds the right to check the participants's background any time after the participant is short-listed. Applications should be received by Network18 via online registrations on or before 30th June 2018. Network18 shall select participants for the Road Trip from all the entries received by Network18. Selection will be on the basis of BMI i.e. all people sending their entries will have to send their BMI as well. Basis the BMI selection of 20 people will happen. By registering for the Road Trip, the participant acknowledges that he/she is aware that adventure travel such as the trip he/she is undertaking involves potentially dangerous activities, some in remote areas of the hilly terrain, with a risk of illness, injury, or death which may be caused by forces of nature, illness, or by willful or criminal conduct of third parties or by terrorism. Accommodations and meals as indicated in the itinerary (B = breakfast, L = lunch, D = dinner); pre-departure information; entrance fees, excursions, and sightseeing noted as included in the itinerary; ground transportation during the trip; guides and any other staff; and taxes, baggage handling, and service charges. Please note: The "B, L, D" notations apply to the period during the Road Trip only and do not include any meals on flights to/from the trip.Accommodations will be on twin sharing basis. The fee payable for participating in the Road Trip is Rs. 1,25,000/- (Rupees One Lakh Twenty Five Thousand only). Participants will require to paying the aforesaid amount for the Road Trip via transfer of money to the mentioned account and submit proof of the same -- only then it will be considered a registered candidate for the event. Before 15th July 2018: the cancellation charges will be 25% of the total amount. After 15th July 2018: No refund. Network18 recommends purchase of the optional supplemental travel insurance package to protect oneself in case of an unexpected medical emergency. Network18 reserves the right to cancel the trip because of inadequate enrollment that makes the trip economically infeasible to operate or because of our concerns with respect to the safety, health, or welfare of the participants. If the Road Trip is canceled by us prior to departure, Network18 will provide the participant with a full refund of monies paid to them; except in the event cancellation is due to a significant event that makes it infeasible to undertake the Road Trip as planned, in which case Network18 will provide the participant with a refund and/or credit towards a future trip/event equivalent to monies paid to them. If Network18 cancels the Road Trip while in progress, the participant will receive a prorated refund and/or a credit based on the number of days not completed on the Road Trip. Without limitation, Network18 is not responsible for any injury, loss, or damage to personal property, death, delay or inconvenience in connection with the provision of any goods or services occasioned by or resulting from, but not limited to, acts of God, acts of government, weather, force majeure, acts of war or civil unrest, insurrection or revolt, strikes or other labor activities, criminal or terrorist activities or the threat thereof, of any kind, epidemics or the threat thereof, illness, overbooking or downgrading of accommodations, structural or other defective conditions in hotels or other lodging facilities, dangers associated with or bites from animals, pests or insects, sanitation problems, food poisoning, lack of, access to or quality of medical care, difficulty in evacuation in case of medical or other emergency, negligence of physicians or medical personnel of for any cause beyond its direct control. In addition, the participant releases Network18 from their own negligence and assumes all risk thereof. Network18 may cancel the Road Trip or other organized activities at its discretion. Network18 will endeavor to give as much notice as possible of any cancellations. Network18 accept no liability for any costs incurred as a result of the cancellation. Network18 reserves the right to change the Terms and conditions at any time and without notice. You will be automatically bound by these modifications. All rights, title, claim and interest, including but not limited to the Intellectual Property Rights, in the Road Trip, the promotional material(s)/activity and in any and all content received shall vest solely and exclusively with Network18 at all times. The participant agrees that he/she shall hold harmless Network18, its employees, officers or any other person in connection with the Road Trip and shall also not file in person/ through any family member and/or third party any applications, criminal and/or civil proceedings in any courts or forum in India against Network18 to claim any damages or relief.